Middleton Place in Southern Pines, North Carolina is an established neighborhood of just 81 homes in a great location. 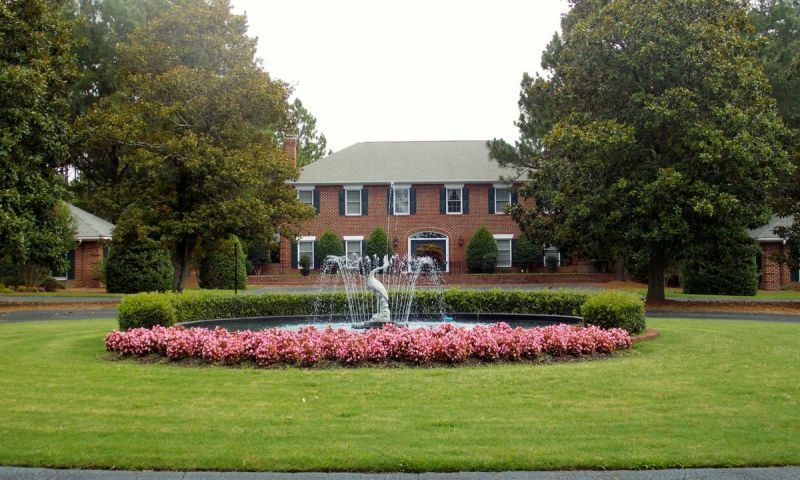 This community offers attractive brick residences ideally situated in the Pinehurst area. The low-maintenance home styles in Middleton Place were designed for active adult homebuyers aged 48 and older with main-level living and quality exteriors. Homebuyers enjoy Middleton Place s beautiful streetscape in a private, quiet setting. When you enter Middleton Place, the first thing you ll notice is the beautiful landscaping along a scenic fountain. Middleton Place is an attractive community that's filled with towering mature trees. Homeowners can enjoy nature's beauty by taking walks along the paved roads in a picturesque forest-like setting. Golf enthusiasts will be pleased to know that Knollwood Fairways' 9-hole golf course and driving range is located just down the road. Middleton Place is made up of 81 residences built between 1982 and 1994. Homebuyers can select an attached or detached low-maintenance home available on a resale-only basis. Attached townhomes in Middleton Place range in size from approximately 2,000 to 2,600 square feet. These beautiful brick homes typically include two bedrooms and two bathrooms with a den or study that can be utilized as a third bedroom. The ranch townhomes include attached garages while the two-story townhomes have street parking. Middleton Place also offers single-family homes. These detached residences also have between 2,000 and 2,600 square feet of living space with two to three bedrooms, two to three bathrooms, and an attached two-car garage. These offer main-level living with brick exteriors and private patios. Owning a home inside of Middleton Place means never having to worry about the hassles of yard work and exterior home maintenance. Residents live a carefree lifestyle with more time to spend with friends and family. With less than 100 homes, Middleton Place offers a close-knit neighborhood feeling where neighbors become lifelong friends. Middleton Place is located about one mile west of Route 1 on Midland Road in Southern Pines, North Carolina. Situated in the Pinehurst area, this community is very popular due to its central location to shops, golf courses, vineyards, and restaurants. FirstHealth Medical Center is less than five miles away as well. Outdoor recreation is easily accessible because Middleton Place is not far from Reservoir Park's miles of trails beside a lovely lake. Active adults looking for an affordable well-constructed home should look no further than Middleton Place in Moore County, NC. Check back soon for more information on the lifestyle in Middleton Place. Attached homes in Middleton Place range in size from approximately 2,000 to 2,600 square feet of living space. Typically these beautiful brick homes include two bedrooms and two bathrooms with a den or study that can be utilized as a third bedroom. Many include private courtyards or Carolina rooms. The ranch townhomes include attached garages while the two-story townhomes have street parking. Please Note: Due to the age of this community, not all floor plans are available at this time. Middleton Place also offers single-family homes. These detached residences also have between 2,000 and 2,600 square feet of living space with two to three bedrooms, two to three bathrooms, and an attached two-car garage. These offer main-level living with brick exteriors and private patios. Please Note: Due to the age of this community, floor plans are not available at this time. If you like privacy and trees you'll love Middleton Place. We fell in love with the place because it feels like you're driving through a forest. Some of our friends questioned why we bought here because no, it doesn't have a fancy clubhouse or all sorts of "stuff" to do. Really, we didn't want that, we didn't want to pay extra for something we wouldn't use and we really value our privacy and like how quiet it is here. Southern Pines is a nice little area, we've got some good golf courses, good healthcare, shops, restaurants and best of all, good people. 55places.com is not affiliated with the developer(s) or homeowners association of Middleton Place. The information you submit is distributed to a 55places.com Partner Agent, who is a licensed real estate agent. The information regarding Middleton Place has not been verified or approved by the developer or homeowners association. Please verify all information prior to purchasing. 55places.com is not responsible for any errors regarding the information displayed on this website.